The key to a professional TV wall mounting is to take into consideration the size, the weight and the viewing angle of your TV. It's essential to know the material of which your wall is made. Think about your wall and whether they can handle it. This may sound hard to you, but it's certainly not a hassle for our professional handymen. Save yourself the trouble and trust Fantastic Handyman with the TV mounting process. We can work with all types of TVs and materials. We will mount the TV on the right viewing distance and angle, taking into a consideration how far your furniture is positioned. Refresh the whole look of your room by combining the TV mounting with wall painting or renovation service. If you haven't decided where to place your TV, our technicians will assist you in finding the best location. They will check the accessibility to power outlets nearby, inspect the material of the wall and find wall studs to secure the TV on the wall. The specialists will have in mind the size of the TV and the viewing distance from the sitting point. What type of mounting can you do? Our specialists have a wide know-how to install different types of brackets according to your viewing needs. Fixed mounting - It places the TV flat to the wall. You can’t adjust the viewing angle. Do I need to provide you with tools and equipment? 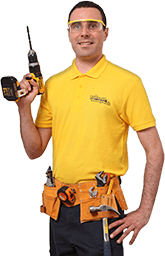 Our TV installers will arrive with the necessary tools for the job.They will have screwdrivers, drills, sealant guns, level, cable clips and sleeves. However, don’t forget to prepare the brackets needed for the installation. We don’t provide these. Do I need to supply you with the brackets? Yes, you need to supply us with the brackets. Be sure to check the product packaging of your new TV before buying new ones. Some TV manufacturer may include the brackets in your order. In case they aren't included, it's best to purchase them for your specific TV model. We can provide you with them if we know the exact model of your TV. The price will be added to your total mounting cost later. What do I need to do before my TV mounting service? It will best if you can double check if the brackets you have are the correct ones for your TV model. If you're not sure they are the ones you need, our technicians can be happy to help. Choose a spot in your home with a power outlet nearby and let us take care of the details. What other services we can provide you with, while we’re there? 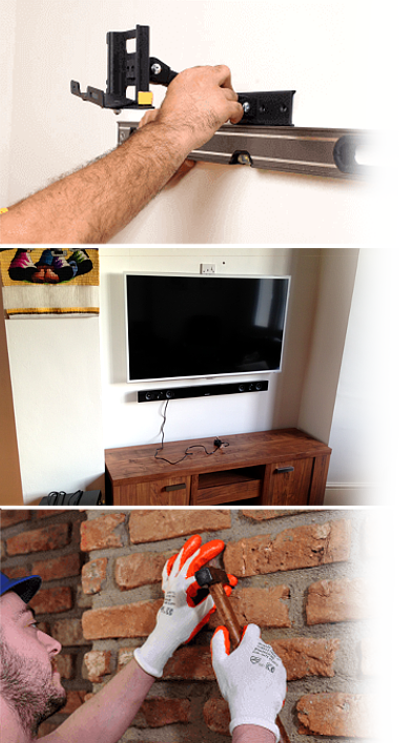 You can book our TV mounting service with another service at your convenience. Take advantage of our full range of services in one visit. Have you ordered new flat pack furniture for your living room? We can assemble it for you! Do you want to renovate your kitchen - we can paint the walls in your favorite color and repair the cabinets for you! Request a quote today!